The gold rush of those early days — complete with stories of lone developers becoming millionaires overnight — quickly dried up as developers raced to the bottom to see who could charge the least. Today, more money is being made on the App Store, but the lion’s share of that money goes to a small group of large software companies. Throughout its nearly ten years of existence, the App Store has had a turbulent upbringing. While the App Store may be a senior citizen in Internet time, as a marketplace, it’s barely out of diapers. But we’ve now reached a point where I believe the App Store will either morph into something genuinely useful or fade away as a fad. I don’t mean that the App Store itself will go away — it won’t — but it could disappear as a business opportunity for most developers. In this dystopian future, the only profitable apps left will be a handful of entertainment apps by huge companies and “business essential” apps, such as those made by banks or news organizations for their customers. The age of the App Store is such that even many wildly popular and successful apps have reached their natural end of life. It’s rare even in the desktop world for an app to exist for more than decade — technology just changes too much for many programs to stay relevant. Mobile apps live fast and die young. Apple recently began deleting apps that developers haven’t updated in years, under the assumption that they aren’t being supported. While Apple has required that apps be compiled for 64-bit for over a year, old 32-bit apps won’t even launch in iOS 11 (see “Apple to Deprecate 32-bit iOS Apps,” 15 May 2017). Individually, none of these factors would be cause for undue alarm. But bringing all three together could result in a catastrophic tsunami for smaller developers. Good Intentions, Grave Consequences — Apple’s intentions are good. Customers downloading apps that haven’t been updated in years is bound to create a poor experience, and lack of developer support undoubtedly generates complaints to Apple. Getting rid of 32-bit code is also sensible: it reduces app sizes, iOS can drop old APIs and 32-bit-only code, and everything new runs smoother and better. It’s also a good way to “encourage” customers to upgrade to more recent hardware (older devices are 32-bit-only and will not run iOS 11). However, Apple’s solutions to these issues have serious problems. The biggest is that, starting with iOS 9, performing a backup with iTunes no longer copies apps to your computer. To restore an app, you must redownload it from the App Store. But if Apple has removed the app for being too old or not 64-bit, the app is gone — there’s no way to download it again! On the Mac, if a developer abandons an app you rely on, you can easily make backup copies and reinstall it if needed. If an app won’t run on a new version of macOS, you can theoretically boot from an older version or run the app in a virtual machine. Worst case, you can usually find a way to at least migrate your data to another app. In iOS, the situation is different. Because Apple exercises total control over which apps are allowed to run and how you get and install them, there is no way to get abandoned apps to work (short of jailbreaking, which introduces its own set of non-trivial problems). Even if all those assumptions turn out to be true, exporting is rarely simple. For example, I have an old iOS drawing app with about 50 drawings I made in it over the years. To get those out, I have to open each drawing and email it to myself, setting several export options each time. It will take me hours to export all my pictures, and I’ll lose aspects of the data in the process, such as text no longer being editable, layers being merged, or parts of the drawing being rendered differently in another app. A different type of problem is that many iOS apps don’t involve data creation but instead run as a service, downloading data from the cloud. A perfect example of this is the Check The Weather app, which requires an Internet service to show you the current and projected weather in your area. Unfortunately, Check The Weather’s developer recently decided to shut down the weather network as it was costing too much. Thus, an app that I paid for and worked great for me for years, suddenly stopped working, with no warning. Obviously, it’s not inherently Apple’s fault that Check The Weather’s developer couldn’t afford to keep paying for the weather network. Indirectly, though, Apple’s policies play a role, most notably by promising users that all app updates will always be free. When developers can’t charge for updates, that eliminates a common source of revenue that could fund ongoing development and operations. Plus, the App Store doesn’t provide developers any way to contact their customers to alert them to untoward situations or alternative apps. I found out about Check The Weather when I contacted the developer to see why it had stopped working. He pointed out that he’d written a blog post on his Web site months earlier. How was I supposed to know that? I have nearly 600 apps on my iPad: I’m supposed to check all those developers’ blogs? A Professional Environment? — Apple likes to promote the idea of iOS as being capable of professional work. In particular, Apple would like us to see the iPad Pro as a laptop replacement for many workers. For the purposes of argument (if only that), let’s assume that Apple’s contention is true. What kind of professional environment allows apps to vanish with no way to reinstall them and potentially loses data you’ve accumulated for years? For a casual home user, losing data to an abandoned app may be no more than an annoyance, but for a business or professional, it could be hugely damaging. Businesses tend to be slow to change (don’t fix what’s not broken), especially if there are migration issues. Just look at how many companies still use Windows XP! Apple’s policy, which encourages abandoned apps, is going to cause a lot of businesses to delay or avoid upgrading to iOS 11 for fear that they’ll lose access to apps and data. As ever more software falls by the wayside this year with Apple’s forced march to 64-bit, more people will suffer the consequences. For many people, that may not be much of an issue, but for others, it could be a serious problem. Looking at my iPad and iPhone, I currently see 101 and 58 obsolete 32-bit apps respectively. That’s about 25 percent of all the apps on my devices! Yes, a number of these are little games I haven’t played in years, and some are apps that have new versions as replacements (either I deliberately didn’t upgrade or didn’t know there was a new separate version). A few of these apps were abandoned years ago, such as Zite and Bento. But if an abandoned app still works for me, shouldn’t it be my choice to stop using it or not? Some of these apps may get new versions before iOS 11’s mandatory 64-bit cutoff, but short of checking with each developer, I have no way of knowing until that happens. More problematic is the fact that roughly a quarter of my obsolete apps contain data. The list includes lots of writing and drawing apps, six photo editing apps, several news apps, and a number of “content” apps (language databases, apps with books in them, and so on). These aren’t rare or uncommon apps, either. Many are from major developers or big businesses. I see apps from Fox, HGTV, Sci-Fi Channel (I refuse to use their new inane spelling), Adobe, and many others. I have an app called Martha Stewart’s CraftStudio that I use for making my own greeting cards. Martha abandoned it a while back (I like to imagine her using Xcode), though the version I have still works fine. Unfortunately, when I upgrade to iOS 11, it will die and I’ll lose all the greeting card designs I’ve made. What’s most disturbing is that I paid for many of these apps. Although I didn’t pay that much for any given app, in aggregate I spent hundreds of dollars on apps that I anticipated would have longer lifespans. Worst of all, some of my obsolete apps are linked to hardware. For instance, years ago I bought a toy car that’s controlled via an app on my iPhone. That app is on my obsolete list. When it goes, the car is useless. Good thing it’s not a $1500 drone! Another 32-bit app lets me use tiny flash memory “hard drives” wirelessly for additional iPad/iPhone storage. (When I travel, I store movies on these for watching on the plane.) Once I update to iOS 11, I won’t be able to use those drives anymore, and they were quite a bit more expensive than the average app. Not good. I’ve heard other horror stories of hardware that stopped working when its app was abandoned. But actually experiencing it is making me think twice about buying any device that requires an app, whether it’s a security camera, kitchen gadget, toy, or whatnot. All this means I’m going to be a lot more cautious about spending money on apps in the future. When the App Store first launched, I was accustomed to desktop prices, and as a programmer myself, I was happy to throw a few bucks to developers for their work. Now that I’m seeing so many developers abandoning apps and Apple rendering other apps artificially obsolete, I doubt I’ll be buying much from the App Store. If my memory is accurate, I used to spend $10 to $25 per month on apps. In 2016 that probably dropped to an average of less than $5. For 2017, it will be even less. Mac Apps May Be Next — While getting rid of 32-bit cruft on iOS makes some sense, resources aren’t as constrained on the Mac side. Plus, most apps aren’t from the Mac App Store, so Apple has less control over what is installed. Despite that, at Apple’s WWDC developer conference in June, Apple made an announcement about the next version of macOS, High Sierra, that makes it sound like 32-bit support on the Mac may be disappearing soon. I interpret that to mean that some apps will work and others may have problems, though I have no clue what such problems would be. If “without compromise” means old 32-bit apps run slower, similar to PowerPC emulation during the switch to Intel processors, that’s very different from not being able to run them at all. Whatever version of macOS succeeds High Sierra is over a year away, however, so there’s time to figure out a solution. For most apps, making them 64-bit is just a matter of recompiling, but that doesn’t help for ancient apps that aren’t still under development. What’s the Solution? — So far I’ve been focusing on the problems, but what about solutions? While I realize that Apple has an interest in culling unsupported apps from the App Store, and I agree that getting rid of 32-bit ones is a valid engineering goal, the way the company is going about it is draconian. Why not put the old apps in a special “old” section of the App Store? Mark them with an Obsolete tag. Set the default App Store search to ignore those apps unless the user selects an “Include obsolete apps in search results” option. Provide a warning upon download that an app is obsolete and unsupported, but let me download and use it if I want. While it seems unlikely that Apple will ever let developers communicate directly with all their customers through the App Store, Apple could contact app users on behalf of the developers. It would go a long way if Apple could provide users with information about obsolete apps, such as a link to new versions, instructions on how to export data, or suggestions of replacement apps. On reflection, I can’t see Apple ever doing that either. But Apple could notify us when apps we buy have been removed from the App Store. This would provide a warning that the developer may be abandoning the app and would encourage users to check for more information. Apple should also do more to encourage the financial success of developers other than the big boys: better discovery of apps, allowing paid app upgrades, removal of “clone” and garbage apps, and more. If apps are being abandoned because they aren’t making money, anything Apple can do to address that problem would be a help. To be fair, Apple has been making improvements to the App Store, notably a faster review process. And in a change to a long-standing policy that hurt developers and customers alike, Apple finally allows developers to respond to customer reviews. iOS 11 will bring a new look to the App Store; we’ll see if that improves app discovery or improves sales in any way, or if it’s just rearranging the deck chairs on the Titanic. What You Can Do — How you respond to Apple kicking apps off the back of the train is up to you, of course. But here’s my approach — feel free to copy or modify it to suit your needs. While I think iOS is highly capable and could be a person’s only computer, I’ve already been hit so many times by abandoned apps that I’ve become wary. I no longer think of iOS as a “professional” environment. Since apps can disappear at any moment, I’m not going to devote much money to buying them nor will I invest significant time and energy into learning and using an app. And yes, I realize that this behavior will result in reduced sales and lowered developer interest in creating “professional” apps. When evaluating iOS apps that I might use for real work, I’ll avoid those with proprietary data storage. I’ll actively seek out apps that let me store data in the cloud — preferably Dropbox — and apps that use standard data formats. Before committing to an app, I’ll always check to see that it has export capabilities — and I’ll immediately test those features to make sure they actually work. My next project is to start going through my list of abandoned apps and seek out replacements for the critical ones. For many, though, I plan to look for a Mac replacement, not just another iOS app. After losing so many favorite iOS apps, I just don’t trust the App Store anymore. I agree with the majority of this article that abandoneware on iOS is really bad. With that said. Why do you have 600 apps on your iPad? You clearly do not use most of them, as you were taken off guard by Check the Weather's demise months after it occurred. Aside from being a hoarder like myself, I can think of a few reasons, app reviews, customer support being just a couple (the latter being my excuse). Beautifully said. My compliments. I figured it out intuitively a few years back and abandoned iOS as a production platform by buying a MacBook Air. But you put it into words so well. The one other tactic I use is to turn off automatic updates. It gives me an extra margin to react when I have the time before updating. Avoiding proprietary data formats and closed/"hidden" data storage is a good practice in general, one I've long tried to follow. Even if a proprietary format's app remains available, having data tied to a single company's product is just asking for trouble. Currently, the only major proprietary-format app I use to any significant degree on any platform is FileMaker Pro, and that's only because I have a database I developed in FMP over a decade ago that's still in use until I have finished replicating it in an SQL/PHP-based form. Everything else I try keep in open formats as much as possible. Like the author, I'm very wary of proprietary data. but since Filemaker data is easily exportable to multiple formats: (including excel,) and the most dependable format of all: plain text - I find it a non issue. In fact, for that reason I prefer it over specialized proprietary software (password vaults, recipe databases etc) . It's not exactly true that you can't backup iOS apps in iTunes. They're not stored as part of the device backups, but if you're using iTunes for backups anyway, you can also have iTunes download your purchased apps to its Media Library, where they can reside like any other data on your Mac. I still have copies of apps that were removed from the App Store several years ago. I do this too. For the last 5 years or so, I also make copies of old app versions. When Apple does an update, it puts the replaced version in the trash, so they can be rescued and archived. However, this still may not be enough to save things if a device needs to be ''restored', and the iOS version you've carefully not upgraded gets replaced with a newer version. Unlike on the Mac, there is no way to reinstall a system once the signing key is revoked. I'm inclined to consider this a form of theft, since I too have paid a lot of money for apps such as interactive books that simply cannot be replaced, though I'm obviously in the minority. But imagine if your bookshelves at home timed things out and ate them, leaving you only the receipt for what you paid. I do this iTunes caching myself, only I let ones in the trash get deleted. I keep a library running as a media library (music, movies, etc), and since I have that on a huge volume, made sense to keep the apps there as well. Home sharing lets you move apps and content between libraries, so if I need an old app, I can transfer it easily enough to my devices. I don't know why this web site keeps adding extraneous characters, there should be no s on the end. That's the article on how to transfer purchases. I've had that problem, too, trying to type URLs. Whatever system this site uses to "publish" comments adds cruft to them. I'm on iOS 10.3.2 on both my iPhone and iPad. Settings>About gives me a count of Applications, but I can't tap Applications to get an app compatibility list (and it lacks a right-angle-bracket to indicate it can be tapped). If you can't tap Applications there, it will be because you do not have any 32bit only apps installed. I noticed this on my iPhone, vs my iPad, the iPad did, but the iPhone didn't. And after clearing the iPad of the apps listed, I can no longer tap on Applications either. What an excellent article. I agree with just about everything he said. The big difference is that I have never had to rely on iOS for any important app, except connecting to internet banking (which I know will always be updated). I'm ticked off at Apple. Some apps don't get updated often because they're focused and don't need a lot of updates. I paid for the app; if it keeps working, don't stop me from re downloading it! They could make it unavailable to anyone who doesn't already own it, without messing with the people who bought it. And the apps no longer being backed up - which I didn't realize was the case at all (thanks for mentioning when it started) - crazy! The main app I'm annoyed about that's 32-bit only is a focused app that works perfectly, does just what it says and what I want, and thus doesn't need an update. The app has in-app purchases, which I haven't bought, but I suspect the developer is happy to get money when people buy them, and I'm happy to keep using it. It's the best multiple-timer app ever IMHO. :-( Psniff. "Before committing to an app, I’ll always check to see that it has export capabilities — and I’ll immediately test those features to make sure they actually work." Highly recommended. As a computer support person myself, this is why I have 450+ apps on my iPad now, and have amassed a collection of over 2700+ apps over the years, checking them to find the ones more likely to last, that provide decent compatible files (preferably without the need to export) with online storage (any, but I prefer iCloud, Google Drive, OneDrive, or DropBox). understand what that means. As for my ipad which is also getting on, i have numerous paid for apps that I stopped using ages ago so every so often I delete them. My hobbies used to include trialling and wasting money on software but I have liberated myself from the 'toyshop' and now stick to my preferred suppliers. And getting more out of the apps I use regularly rather than thinking some other or new app is somehow going to make my life easier. Thinking through the experience of an app and whether it really would make the big difference it advocates is a more stimulating hobby! Well, for one, Apple itself. Pages can't open anything older than ClarisWorks five, even though I have thousands of documents in older versions of ClarisWorks or Apple works. Text-edit plus provides a translator that Apple didn't bother to provide. So this is nothing new. Agree with your Claris Works comment. I have my first Mac, a PowerBook 190cs loaded with useful CW4 and 5 material I have updated on it from my original CW3 app. I migrated the current files to a 2005 (late) Mac, and keep most files current there. Old data is always accessible and upgradeable, mainly because of the ease of use of CW. Exporting from CW is a cinch, as always. BUT other old apps are hopeless, grounded as the are in old software. And it just doesn't make sense to keep using Ready-Set-Go when I have InDesign. Just a choice I have to make. Writing this from my MacBook Air. I would have thought that by now someone would have created an Appocalypse website where users could list 32 bit apps, along with links to public statements from developers indicating whether or not there would be updates. I've contacted a few developers directly, but it must be annoying for them to receive the same question so many times. Sounds like the author's problem is with developers abandoning their products & customers. Apple can't save you from that. the Check the Weather guy could have pushed a notification out, but he didn't. Again, developer is at fault for not caring, not Apple. the Professional use case fears are just that -- fears. Major productivity apps aren't going to vanish, and essential enterprise prod apps are going to be in-house deployed and not on app store. Stay in contact with the devs of any public app your business relies on and get an idea of its road map. That's what business IT planners do. As for keeping old apps in an "Old" section of the store -- it's not about store organization. it's about supported frameworks on every iOS device. keeping legacy 32-bit and 64-bit makes the OS and devices heavier. think Windows. "Apple can't save you from that." Apple could allow me to restore apps that I've paid for even if they no longer are for sale. Apple could ease the users pain by warning that apps and their data will be lost forever when the device is restored because they're gone from the store. Apple also could let developers charge for updates. That would make development more sustainable and keep apps alive longer. The "race to the bottom" prices and free updates forever policy sets the tone for what developers can and will do, and that is certainly on Apple. Apple's responsible for their part, which includes things like not backing up apps, not allowing people to re-download apps based on arbitrary criteria like the last update time, etc. Actually, pushing notifications that way is probably against App Store guidelines. > 4.5.3 Do not use Apple Services to spam, phish, or send unsolicited messages to customers, including Game Center, Push Notifications, etc. Not that there aren’t plenty of apps that abuse this rule and seem to get away with it. There are plenty of technical reasons to strongly encourage the move from 32 to 64-bit. For example, [performance - Supplying 64 bit specific versions of your software - Stack Overflow](https://stackoverflow.com/questions/324015/supplying-64-bit-specific-versions-of-your-software). The main problems are that loading both sets of libraries is resource-wasteful (bad for the user) and slows adoption of new technology (bad for the platform). Why Apple thinks it's ok to remove an app I paid for that still works fine without giving me the option to retain it, is beyond me. Apple definitely takes some blame for the app store situation and rightly so. No paid upgrades or demo versions is another blunder. That said, the constant developer whining about how they can't make a living off of apps and how they need subscriptions and ads to survive does not resonate at all with me. Who said you need to be able to make a living off your hobby? When did you become entitled to living the rest of your days off of one good idea? Why not charge $20 once if that's what it takes to make it sustainable rather than bait people with supposedly 'cheap' subscriptions with hopes of later locking them in? It worked for years on computers (shareware). What's changed is devs' level of expectation. Coding got easier, so why do earnings need to be higher? The reason you have any good apps on iOS is because someone cared enough to make them. Independent software developers are only able to make decent apps and (germane to this article) *keep them updated* if they can justify taking the time to do so. In most cases, that means transitioning to making apps their full-time jobs. The people that are doing it as a "hobby", or who charged $20 a pop for what it would take to be a sustainable business and then saw perceptibly shittier but good-enough "free" apps take their customers or simply bury their "expensive" paid app at the bottom of all the lists, or those who didn't transition to recurring revenue from ads or subscriptions are the ones who have to abandon their apps. Criticizing app developers for wanting to make enough for actually developing an app to be worth their time relative to taking a regular job working at a company is dismissive and short-sighted. It means that there are going to be fewer good apps, and way more exploitative ones. EA didn't get a reputation for burning out programmers and shitting on their customers with money-sucking microtransactions for nothing. If indies can't build and sustain enough business to stay independent, what we're left with is EA and their ilk. I disagree entirely with that premise. Shareware devs in the 90s didn't have the fancy coding tools available devs today have. Coding has become way more convenient and is actually easier. Children can code today. Yet somehow, some devs think they're entitled to more income than their predecessors in the 90s. Somehow they believe they should be able to quit their day job as soon as they are on the app store. I agree that it's a mistake on Apple's behalf not to allow demos or paid upgrades. But devs can de facto still have paid upgrades and several do by simply telling users of the existing app they'll have to migrate to a "new app" to get the new features. The new app then costs money. Not elegant, no doubt. But it can be done. This whole spiel about how they need subscriptions and ads is just devs following a fad launched by the "free economy" (thanks Google) and their sense of entitlement. Charge me what it costs and if it's good I'll pay. Otherwise, die in the race to the bottom. Shareware in the '90s was for PC operating systems, not for mobile OSs. As well, applications then were substantially simpler than they are now. As computing devices have gotten more powerful they support more complex software. So better development tools have been essential. You've got more power in your smart phone now than you had on your desktop in 1995. So comparing ease of development now and then is bogus. Apple has almost single-handedly killed the market for shareware. It was a great model. You could try something for a while to see if you liked it; if you did you would pay for it by the end of the trial period. If not, it would (usually) stop working and you would "abandon" it. And upgrading software has always been and continues to be easier outside the App Store, for developers and for users. Apple has it's own reasons for doing things the way they do—and how we feel about those reasons usually means less than nothing to them. That said, they may be killing the goose that laid the golden egg. The App Store has failed to keep up with the needs of developers and users. If the App Store begins to fail, iDevices will start to fail as well. As the iPad is doing now. It's also a commonplace that some users have no respect for the work of developers. Even a "hobby" takes time, effort and skill. It's little short of a miracle that some developers, even Apple, continue to offer some excellent apps for free. In Apple's case, of course, they do so in order to add value to their hardware, where competition with non-Apple products is still fierce. And, for the most part, Apple customers get a better deal for their money. On the Mac, for instance, you get a bundle of mostly useful free apps, some of which Apple used to charge for; on the PC, in order to compete with other Windows OEMs, all you get is sponsored crapware. Synergy between iOS and the macOS has improved as mobile CPUs have gotten more capable. The two operating systems will soon share a common file system for the first time. This should improve cross platform compatibility substantially. And, it is to be hoped, help with data retention. That is, of course, if Apple doesn't kill that golden goose. Your second paragraph describes the "Beta vs. VHS paradigm". There's another factor when it comes to macOS apps though. It's the new Apple Files System. I know it won't (probably) be mandatory to convert to it from HFS+ but it'll definitely be case-sensitive. And there's still a ton of software that do not support. Most notably Adobe Creative Cloud but also a ton of games, especially by Feral Interactive. While it's unfortunate that some older software has fallen into limbo, this is not a problem unique to iOS. Most people's alternative with standard computers has been to keep them on an earlier OS. Only true geeks can figure out how to run VMs, and they are presumably easily capable of navigating the technical hurdles. There's nothing that forces you to update to the newest version of iOS (unless you have everything set to auto-update) and you can elect to run your obsolete apps on an old version of iOS on old hardware. I still have an iPhone 4S running **iOS 7(! )** as a camera/game device for one of my sons. Some of the games on it won't run on any newer version of iOS. It's only the New Hotness that will not run older versions of the OS, which is equally true of both macOS and iOS. For perspective, Leopard was the version of OS X contemporary with the first iPhone. How many of you are still running a Leopard, Lion, or Mountain Lion machine? Archiving older apps is like keeping around old installer packaages. Again, geeks — who don't really need anyone to enable their packrat tendencies — are disproportionally more likely to A) care or B) bother doing this. Most people will upgrade or find alternatives as they change hardware or as OS updates force them to stop running old software. macOS (the operating system [formerly known as OS X](https://en.wikipedia.org/wiki/File:Prince_logo.svg)) has shed apps along the way too. I had several apps that didn’t work post-Tiger since they relied on PowerPC architectures. I still have that PowerPC machine, and it's still usable, though Dropbox has discontinued support for it. I delayed updating from Snow Leopard due to a couple of heavily-used apps, which I later found alternatives for. I have an encrypted USB drive that is the only way to transfer some files from my work PC that will not work with anything past Mavericks, which has kept me from upgrading my home iMac so far. I'm old in tech years, so I've been burned by the format incompatibility problem before. The transitions from Apple Works to WordPerfect to Word, none of which had good conversions between formats, made nearly 5 years of writing unreadable for years until I found a way to extract and clean the text. Like other commenters, I've learned to steer clear of proprietary formats and apps that don't have export capabilities. I write in plain text with Markdown formatting now and treat anything without an open or at least a widely-readable, readily-convertible format as fungible. The one app on my iPad Mini flagged as requiring updating to work in future is "The Lost Treasures of Infocom." As the last update for it was in 2013, I'm amazed it's still working today! There is a certain irony, given that this is itself a port of software originally written back in the days of (MS-)DOS. Have to agree with you on most of your points you brought up. The apps I run on my Mac's are going to slowly wither and die as Apple goes 64 bit and I won't be replacing them and a lot of them I have bought over the years since 2007. There's an economic truth behind all of the wailing and gnashing of teeth here: booming sectors see a gold rush and hundred of suppliers, but, as any sector matures,winners will emerge and tend towards oligarchy. Just an owners of Nashs or Hudsons or, even, those 1st-decade steam-driven cars, were sad to see GM, Ford, & Chrysler win and obsolete their investment, so all the little apps will lose to an emergent software oligarchy as well. The only solution is to not just pick what you like, but to guess what other people will like as well. It's just an economic truth of capitalism. My own take is that it is safest to use Apple stock apps when possible as they will be likely to always be brought along on the platform. Oh yeh? Have you heard of AppleWorks? iWeb? iPhoto? Aperture? Not that Apple is the only one to obsolete apps and file formats. You could never open a Microsoft Works file in Microsoft Word. Dumb, right? That said, MS Office has provided reliable formats for a very long time. In contrast, Quicken files quickly (pun intended) become obsolete. Other once reliable file formats have gone by the wayside, like Word Perfect. If you really want to preserve your content, PlainText has been around almost forever. Of course you don't get much style in PlainText. But you can always import such documents into a capable word processor or layout program for styling. 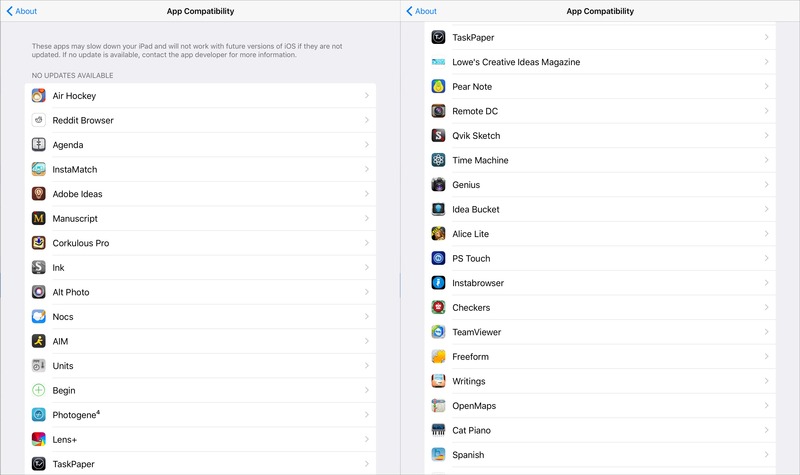 Oh, and you can still open old PDFs with Reader—still a free app. At one time Pages (version 4.3 - iWork '09) could open AppleWorks documents. And I was lucky to have converted all my important AppleWorks files before Pages mysteriously lost that capability. Remarkably, Pages preserved my AppleWorks style sheets. Which were then properly retained when I exported the files in Word (.doc) format. And they also came across when I imported the Word files into InDesign. Sometimes it's better to be lucky than good. For what it's worth, iWork '09 was the last version to come on a DVD. If you've still got your '09 DVD you're in luck. And the old iWork apps still run in macOS 12.x Sierra. How long that will be so remains to be seen. I just noticed that Adobe InDesign from CS5 is 32 bit, which I installed on my computer (and paid for), so t won't be usable if forced to go to 64 bit. I object to the way Adobe uses the subscription system so will likely be stuck. making them 64-bit is just a matter of recompiling..."
Most 32-bit Mac apps tend to be Carbon and most of what makes Carbon an issue for 64-bit is the UI. Mac Carbon apps need a least a re-written UI in Cocoa ( i.e. Foundation/AppKit ) and this is non-trivial and not possible with a simple recompile. That's a pretty brutal assessment, but I think true. As a developer I think I'll update my current app and leave it at that. P.S. Wow! 600 apps. I've got 10! Two different worlds. Apple itself has done some of that nightmarish stuff. We lost a major portion of diabetic history data when Apple **shut down** the health app because one of the standard glucose scales (that we don't use) was not there. The data was gone after they FINALLY updated the app to get that other measurement in there. Also thanks for the suggestions to avoid some loss in the future. I already back up all in-app data separately, but have already lost some data that was proprietary in Calorie Counter (so much for tracking on weight loss charts over years). I will from now on be careful to check for export options as well. I can relate so completely to the author of this article... I am in the same boat, but worse! I have 1300 apps on my ipad pro. Oh my god, the tech hoops I had to jump through to transfer 1100 of these from my ipad air, and the time involved was ghastly. (And I am just a self-taught amateur... I knew BASIC on an Apple IIe as a kid, and Adobe products as an adult and that's it). Now, I find out that of them are going to be rendered useless. I am so angry. Last year, I even figured out how to save the .ipa's, and thought I was safe. I will now be forced to split my apps between the old ipad and the new one, just so one can run the 32 bit apps. That means apps like Amerigo (video caching) and InAWorld (the coolest video trailer maker ever) will he on one, but half of my photo and video editing apps will be on another. It is going to be annoying and confusing. I am all for the progress of ios 11, but I agree that we should a) be given obvious warning and b) a way to keep running them.